When younger motor racing enthusiasts think of Daytona, images of stock cars on the International Speedway come to mind. But older folks remember that Daytona Beach was a site for setting early land-speed records. The history of racing at the beach extends almost to the turn of the last century when cars themselves were in their infancy. Famous automobile personalities of yore participated including Barney Oldfield, Ralph De Palma, Ransom Olds, Henry Ford and the Stanley Brothers. In 1970, I was sent on a photo shoot to Florida; the assignment included going to the Daytona 500. Because I had not obtained credentials in advance, I was ushered into the office of Bill France, Sr. Since I had previously raced sports cars, we had a short and interesting chat. I found him most affable and I was given a pass to go almost anywhere. Bill told me that oval races at Daytona Beach were as old as record attempts and that the Speedweek predated the Indy 500. There is a three-mile length of sand extending from Ormond Beach south to Daytona Beach. The area encompasses both beaches, but when the sanctioning body—the American Automobile Association—built a clubhouse just over the line in Daytona Beach; from then on the press credited Daytona Beach as the location for racing and record attempts. The 23-mile straight stretch of hard-packed sand is approximately 500 feet wide at low tide. It’s bordered on one side by the ocean and on the other by grass-tufted dunes that provide ideal locations for spectators to observe whatever is going on. Although seemingly ideal for racing, the condition of the sand varies due to the last high tide. Wind conditions can also affect the surface. Tycoon Henry Flagler was a real estate promoter, railroad developer and partner of John D. Rockefeller in Standard Oil. He was key to the development of Florida and founded the Florida East Coast Railway. The railway ran from Ormond Beach all the way to Miami. Rockefeller wintered at Ormond Beach. When Flagler built a hotel there, he proposed racing on the beach as a promotion. 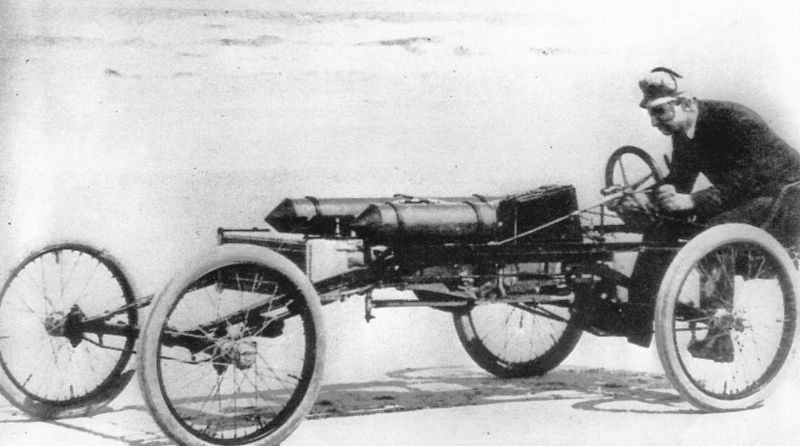 Starting in 1903, land-speed record attempts, as well as oval-type racing, took place on the sand. Oval courses were delineated by barrels. Record runs were made on the straight stretches with posts marking each measured mile. It was reported and even repeated in some histories that the first contest took place between Ransom Olds in his “Pirate” and Alexander Winton in his “Bullet” in April 1902. Some research, however, has claimed the date was perhaps wrong since neither car seems to have been built by April 1902. It remains a mystery why the myth was perpetuated; perhaps it was due to a typographic error. At any rate, the first officially organized event took place on March 26, 1903 between Olds and Winton. The first timed run was by Olds in the “Pirate” with H. T. Thomas at the wheel. But then Winton in the “Bullet” beat him by 0.2 seconds, setting the first record over the measured mile of 68.198 mph. The happening was sanctioned and timed by the AAA, although the FIA refused confirmation. It was held during a weeklong event—the “Winter Carnival” organized by the Ormond Hotel. Thus was born what came to be called the “Speedweek,” eventually, the “Speedweeks.” As an aside, Winton is credited by many as the founder of the American automobile industry. He was the first to sell a gasoline-powered production car to a private individual on March 24, 1898. 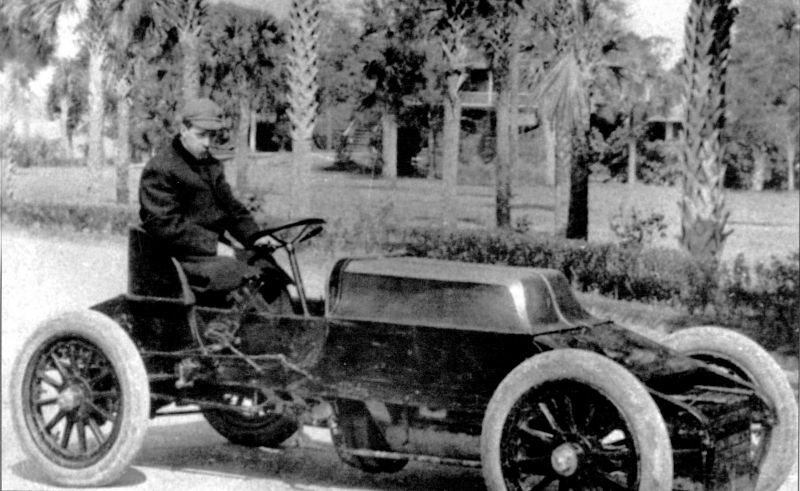 H. T. Thomas driving Ransom Olds’ “Pirate.” When Olds started manufacturing Oldsmobiles, Thomas became the supervising engineer. Alexander Winton in his "Bullet Number 2" set the first record at Daytona Beach of 68.198 mph. The next year, Arthur McDonald went 104.65 mph in his 90-hp Napier setting a new record for the beach. Again, the FIA refused recognition. The victory was marred, however, by Herbert Bowden who went 109.756 mph in his 120-hp Mercedes called the “Flying Dutchman.” But the car was overweight and disqualified. In January 1906, The twin Stanley Brothers, Francis and Freeland, brought their steamer, the “Rocket.” They came to prove that steam was a superior method of propulsion. 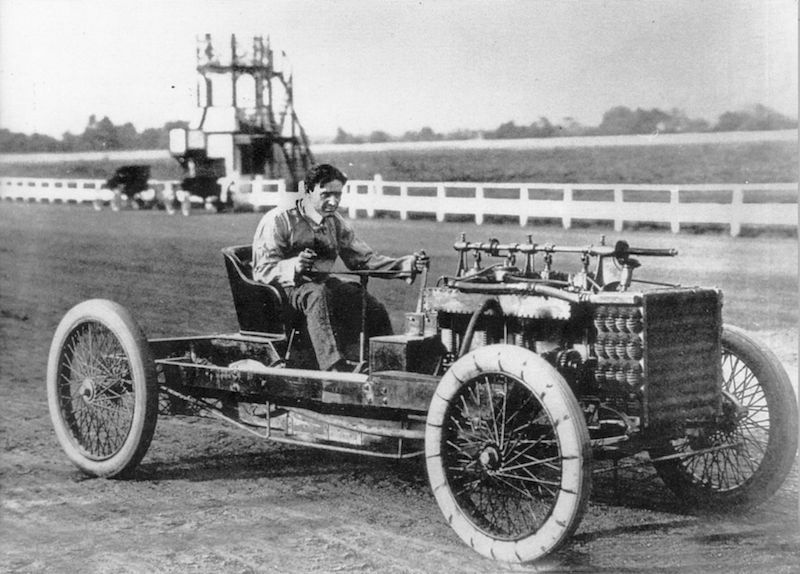 Louis Chevrolet was there in a Darracq, but Fred Marriott, driving for the brothers, achieved the first world record at Daytona Beach of 127 mph. This was even more notable because Marriott was an American driving in an American-built car. And lo and behold, the FIA accepted the car’s performance over the flying kilometer as a new land speed record. The record stood for three years. Fifteen world records were set at Daytona Beach through March 1935, after which land speed record attempts were moved to the Bonneville Salt Flats. 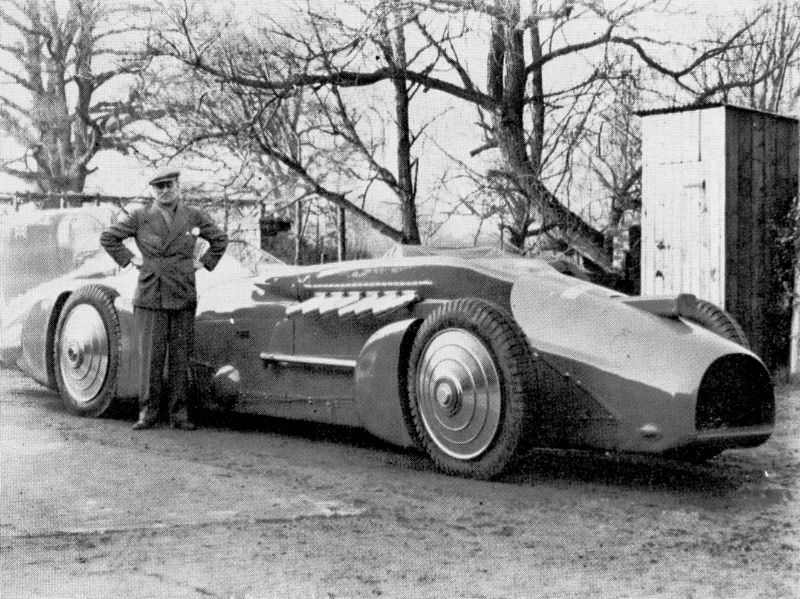 Malcolm Campbell, who had set a new record in his “Bluebird” of 272.46 at Daytona, broke the 300 mph barrier at Bonneville in September 1935. Record attempts in production cars, however, continued at Daytona into the fifties. 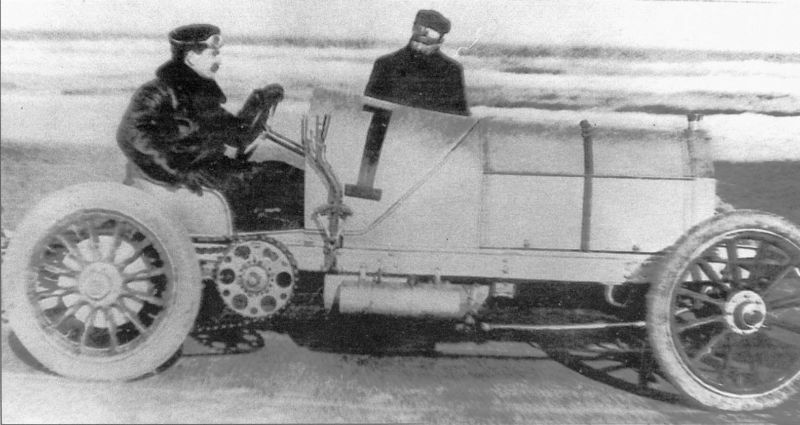 William K. Vanderbilt in his Mercedes on January 27, 1904. He set the first world land-speed record of 92.3 mph. Barney Oldfield in Henry Ford’s car. Although garnering the most attention, the Daytona Beach story doesn’t begin and end with speed records. There was wheel-to-wheel racing too on sand-packed ovals. Early on, the course length was a little over 3 miles, but later lengthened to 4.2 miles. In 1938, Bill France, Sr., who had moved to Dayton in 1935, took over the operation. (France himself also raced on the sand.) He formed NASCAR in 1948. The beach course had its final event in 1958. The next year, France’s triangular 2.5-mile Daytona International Speedway opened its doors, or gates, as it were. The complete story of Daytona Beach rates a book, not a short article. Unlike other race venues, you can experience it yourself. For a small user-fee, you can drive on the beach from February through November. (Don’t get too excited; there’s a speed limit of 10 mph and you share the beach with sunbathers, pedestrians and wildlife.) And if you have a vintage car, you can take part in the annual parade on the beach held during Speedweeks. Also, visit the Halifax Historical Society and Museum at 252 S. Beach St. and view the Lawson Diggett racing collection. Very engaging article and information. Much of the early century of speed was written on the sands of Daytona. Thanks for sharing some of it! Two corrections: The man who broke the one-mile land speed record in 1904 at Daytona was William K. Vanderbilt, Jr. (Willie K’s father was William K. Vanderbilt). A great article that goes into some enlightening historical facts. I would strongly debate calling a Land Speed race car a Sports Car though. A land speed car is quite different from a sports car, just as a street sports car is quite different from a track race car. Each are/were built for a different purpose. Land speed cars were generally massive and heavy with one goal, straight ahead and all out speed. A Sports track race car, was built for cornering, body weight distribution and more. I write this because I own a special one off exotic sports car built between 1933-1936 that some have compared to Land Speed cars and sports Track race cars. It was neither, it was a sensational first in a Street exotic sports car design. The builder, unrecognized at this time for his very special exotic sports car, was also one of the grandfathers in building the SCCA in its infant years. The above mentioned car is no bigger, taller, wider or heavier than a D-Type Jag and was copied from for decades.Many of its innovations are still in use today, even though modernized. & a rough and very incomplete story with brief talks about the differences of land speed, track and sports cars. Blue Bird Gasolean Salt Flats: Hit Speed Record of 272 Miles Per hour too!in 1938 A.D to With Gasolean Record too! My husband is HT Thomas’s great grandson. We are trying to find an original print of him you show above. Would you know how to guide us? His uncle has a copy in the family home, but no where else. Thanks for your help! I will keep searching! My great grandfather, James S Laughrey Sr used to race here! And his brother in law, Murray B Aultman, who won the race in 1910 in his Hudson. I’m trying to find more information. I have pics of the races that have probably never been seen and am curious to know more. It was a big part for them!